Both Islands in just 6 days! Make a bee-line for the city of sails on this quick South to North pass. The Queen Bee starts off in stunning Queenstown and takes you right up to Auckland on a minimum travel time of just 6 days. Take in all the stunning South along the east coast before cruising through rugged North Island terrain, rolling farm lands and ancient volcanoes. This pass is perfect to jump off if you want to spend a little extra time in hot locations. There is plenty to do in New Zealand’s cultural capital before your final leg to Auckland. Travel from Wellington to Taupo in time to meet our mates at Skydive Taupo, or relax with an evening cruise on Lake Taupo. Hop off in Taupo if you are keen to climb the epic Tongariro Crossing. Your Driver Guide will book this in for you. 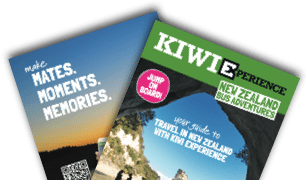 Experience the highlights of the North and South Island of New Zealand with our brand new Queenstown to Auckland express pass.